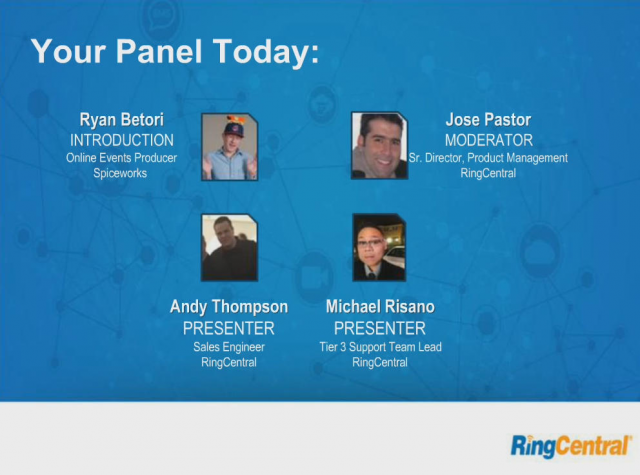 RingCentral, a leading cloud-based business phone system provider, will be hosting a live Computer-side chat about networking requirements for a hosted VoIP solution for your business. Andy Thompson, Sales Engineer, will lead the conversation, answering frequently asked questions about what it takes to be ready Day One when moving to cloud VoIP. Don’t be fooled by his title, Andy’s not a Sales guy, he’s one of the RingCentral tech experts brought in pre-purchase when you’re ready to go geek and talk tech. Michael Risano, Tier 3 Support Team Lead, will also weigh in, and man the Chat feature, answering individual questions and kicking over hot topics for Andy to address to the whole group. As a key member of RingCentral’s support team, Michael knows what can trip you up and how to fix it – from router choices to carrier questions and what to do when the Internet goes down. Andy has been with RingCentral for a year as a Sales Engineer, providing account management to all sizes of customers, completing both onsite and remote implementations and demos for prospective customers and providing remote support or implementation when needed. Michael has been working with RingCentral for about 5 years now, as a Tier 3 Support Team Lead, making sure there is a seamless integration of our service with customers' systems. Micheal spent years in IT at Kaiser Permanente, so he is uniquely suited to helping IT customer implement and fine tune their RingCentral system.